You should first read the Gangs of Steel Harbor entry for a full background of the Wolf Gang and Prime Movers. Maureen Skach is an unpredictable schizophrenic and casual killer, who for most of her life did not know that she was a superhuman. Her ability is that whenever she kills somebody, she immediately and permanently absorbs their superhuman abilities. She also absorbs the powers’ physical manifestation. For instance, Hardhide’s durability powers also gave her a deformed epidermis, though hers looked a bit different than Hardhide’s. From Ignition I: Pyrotechnics: 07 (but not the associated Accuracy Skill). From Hardhide: BODY 05, Skin armour: 05, Bonus: Half of Skin Armour (round down) applies against non-electrical energy attacks (+1), Distinct Appearance. From Bone Crusher: STR 10. Maureen Skach was the psychotic girlfriend of the equally deranged Ignition, one of the gang leaders in the Prime Movers gang coalition. The irrational Ignition ended up disobeying the boss’s orders one time too many, and was thrown through a brick wall. He was hospitalised, though with little hope of getting him out of his coma anytime soon, if ever. The very emotional Maureen frequently visited her man, and once glimpsed Barb Wire leaving his room. Skach, never having had a very strong grip on reality, hysterically assumed that the presence of the beautiful Barb Wire meant that her comatose boyfriend was somehow having an affair. She rushed into the hospital room, yelling at the inert Ignition and eventually murdering him with her bare hands in a fit of rage. At this instant, Skach somehow inherited Ignition I’s powers, which her damaged psyche interpreted as divine justice. Calling herself the new Ignition, she rallied most of her lover’s old gang and took over. One of the younger and most psychotic members, Nikki, became her aide. Ignition II was even allowed to join the Prime Movers, participating in two of the major Movers offensives over the following year. Her ability to remotely detonate explosives without having to fiddle with detonators of any sort was considered a boon by Mace. Furthermore, she apparently did not pose as many discipline problems as the first Ignition had. When the first Ignition’s old partner, Hardhide, got out of prison, he came to see his old buddy and found Maureen in his stead. The increasingly erratic Skach proposed to become his new partner and even his lover, leaving the deformed Hardhide speechless. He soon took her along for a bank heist but she just did not care about the plan, exuberantly pranced and joked about, and brought the obviously volatile and trigger-happy Nikki along. When they drove away from the bank, Maureen just started burning the bills one by one and throwing them in the street for giggles. She then crashed the pursuing police cruisers by setting their tyres on fire. Aghast, Hardhide decided to renounce any partnership with the psychotic Skach. At that point Skach got an intuition about how her power worked, and killed Hardhide on a whim, by igniting the large quantities of alcohol he had been drinking. Skach’s intuitive leap was correct. She did absorb Hardhide’s superhuman powers just like she had the first Ignition’s. Drunk with power, the increasingly demented Ignition ambushed and killed a local strongman called Bone Breaker and absorbed his superhuman strength. Her goal was now to kill every superhuman in Steel Harbor and become unstoppable. She assaulted Airborne of the Prime Movers, but several Prime Movers OGs intervened before she could kill him. When Killerwatt hit her Skach realised that she wasn’t proofed against electricity, and both sides of the fight had to retreat to lick their wounds. 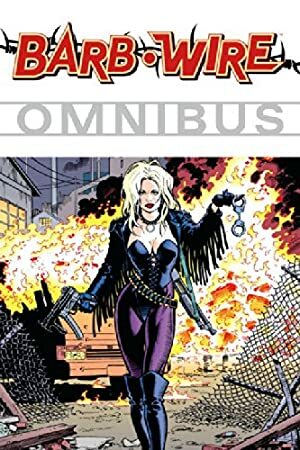 Based on Nikki’s strange theory that Barb Wire could beat superhumans because she had some sort of intelligence super-power, Ignition II went after the bounty huntress. Not finding her at her pub, she kidnapped Wire’s brother Charlie instead. Barb Wire rode to the rescue. Nikki engaged her using Charlie’s special weapons, but was apparently slain. Nikki and two other Ignition gang members. Charlie yelled about using his stolen electrical weaponry, and Barb Wire eventually took Ignition down after she plugged her weapon into a power generator. The haggard, electrocuted Ignition remained out of it long enough for the authorities to contact Golden City’s government. Ignition was transferred by Mecha into one of Golden City’s special prisons. Ignition survived the purges during Law’s take-over, but was not seen again. After she absorbs Hardhide’s power, Skach doesn’t become as deformed as he was, but her skin becomes leather-like and brown-ish. Skach is a deranged lunatic. Her moods are unpredictable and who will fixate on mostly random things with murderous intensity. When the fact that she’s irrational is pointed out (for instance that Ignition I couldn’t have possibly cheated on her since he was in a coma), she instantly becomes violent. She seems to crave power, recognition and fun – and the freedom to indulge in random, thoroughly irresponsible whims. She has no sense of the consequences of what she does, but she does have a certain level of cunning that makes her a dangerous opponent and criminal. She knew enough to toe the line with respect to Mace Blitzkrieg. Of course, having a lunatic who can set fire to anything with her mind (and later became even more powerful) is a bit of a problem. She conveys a clear sense that she could go completely ballistic at the drop of a hat and inflict horrendous pain and carnage for no reason. This became even more obvious as she grew quite powerful for the Steel Harbor setting. See “Payable on death” below. Serious Rage, SPI (manic/hysterical behaviour). She can only Adapt Powers (and super-powered Attributes, such as a high STR), and it has a Range of 0 APs. She can only do so on people she personally kills, instantly Adapting from them at the moment of death. The APs in this writeup are arbitrary – her upper limits are unknown, though presumably there are some. The Bonuses and Limitations are also Adapted along with the relevant Powers. Furthermore the Advantages and Drawbacks associated with the Character’s Powers are also absorbed at no AP costs (since they are assumed to even out in the long run). While the BC and FC of this are significantly lower than straightforward Adaptation, exact numbers largely depend on the expectations of the campaign about Killing Combat and actual death rates of powered NPCs. Ignition’s sidekick, Nikki, was a teenaged girl – perhaps 15 – and was about as unhinged as her boss. This is likely what caught Ignition’s attention and soon she was accompanying her boss everywhere, doped out and toting some automatic firepower. She also acted as an amateur bodyguard, with a tendency to open fire on anything that seemed suspicious. Or just because she wanted to shoot at things. Ignition II and her gang (Low). Age (Young), Serious Rage, SPI (manic/hysterical behaviour), SIA to some drug(s). Cheap AK assault rifle [BODY 03, Projectile weapons: 06, Ammo: 07, R#04, Bonus: Autofire]. Writeup completed on the 9th of June, 2010.